Center yourself and build a foundation for personal power through this wonderful, internationally acclaimed self-study course. You will learn to heal and empower yourself and your life, and achieve your dreams. As you complete this easy-to-follow, inspiritational workbook with its six accompanying audio tapes, you will release past and present stressors, create desired realities and most importantly, KNOW and accept yourself from a place of wisdom and compassion. Each chapter guides the reader, through related transformational journaling and imagery exercises, to build and enhance self-healing and spiritual development. The accompanying tapes will unleash your power to recreate yourself and your life through higher guidance. Includes the renowned Centering Tools Workbook and the following tapes: Freedom from Stress, Releasing the Past, Connecting With Your Higher Self, Clearing Blockages, Accepting and Loving Yourself, and Creating Your Own Future. 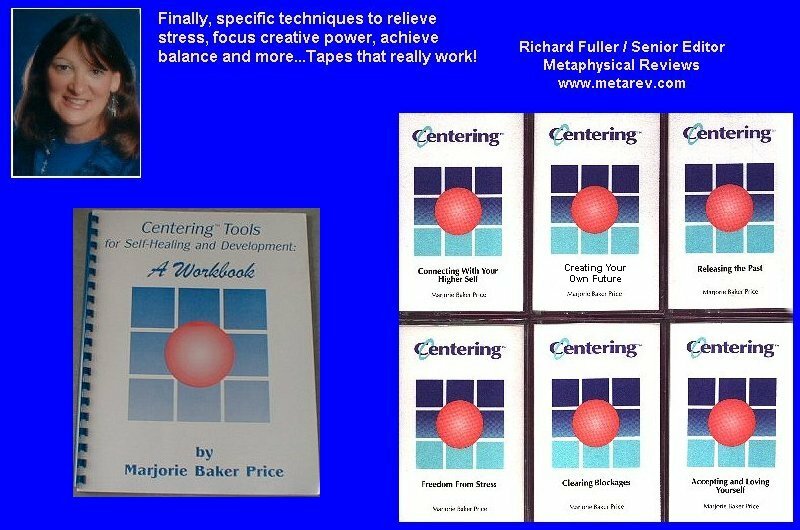 Marjorie Baker Price is a registered nurse, and is the author of the nationally acclaimed Centering Tools audio tape series for emotional, spiritual and physical balance and well-being.. Any questions please feel free to contact me at Marjorie@centeringtools.com. 'Finally, specific techniques to relieve stress, focus creative power, achieve balance, and more...Tapes that really work! '-Richard Fuller, Senior Editor, Metaphysical Review.